After my not-so-happening review of the KONG Zinger Dog Toy, it is time for a happier review. As mentioned in my previous post, I do not like giving bad reviews but I also need to be honest to all my doggie friends who might be interested in the toys Frodo and I are playing. We strive on giving authentic reviews and not just give reviews for the sake of it. And for me, it is not just about dissecting a product/toy to write a review but to relate our tales tails while testing it. With that said, it is time to for my next toy review! Please forgive me that is going to be one long post. You see, mummy insists that I need to tell the tails of Frodo's rambling ways versus my rocket scientist ways. Aka 'Pinky and the Brains'. We have videos for evidence too. Enjoy our rambling tales tails. The KONG Rambler was my second third toy selection. The second was the KONG Wubba which I sneakily added into the Kohepets shopping cart without mummy's knowledge. Mummy always says, "You can never beat a dog's physical energy but you can beat their mental energy". Thus it was quintessential to add a interactive/thinking toy to the cart. One of our utmost favourite range of interactive toys is Nina Ottosson. We own quite a few of these from couple of years back and we do still play with them now and again. Rumour has it, Miss U is planning to send us Nina Ottosson toy(s) to test! Woof! We cannot wait to see what comes our way! Anywoof, so I was in search of some interactive toys I could purchase just because I need to exercise my mind. And also, I wanted to make sure I had a varied selection of toys to review on. Not just those chase and fetch type toys to flaunt my flapping ears. 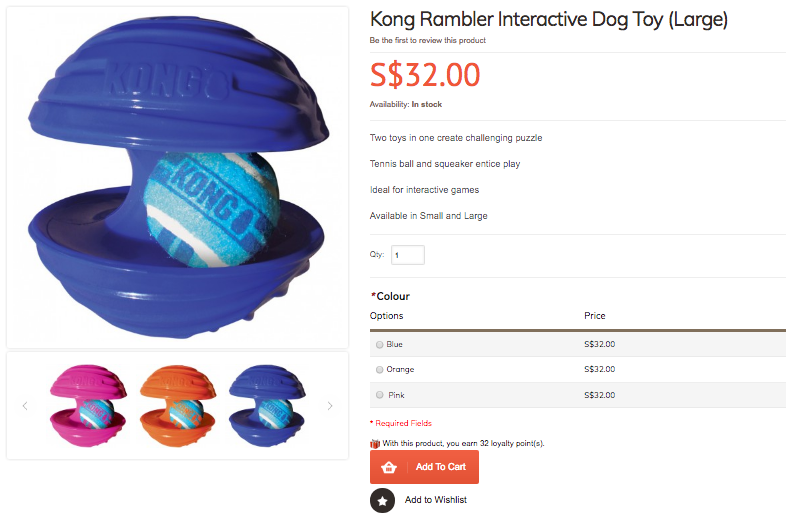 KONG has a variety of interactive toys. As mentioned in my Zinger toy review post, I do favour KONG toys. Well, that was before NERF won my heart. Anywoof, you might also know by now that my toy selection criteria is pretty much - plush, no; plasticky/too-plasticky, no... and I tried to avoid selecting those treat-dispensing toys unless it is a die-die-must-have type of toy. I was looking for toys that both Frodo and I could play with at the same time. After going through my elimination process, I ended up with the KONG Rambler toy. Trying to get that tennis ball out... surely it would exercise our my brain. A little. And Frodo's brain. A lot. My KONG Rambler (Large) fresh out from the Kohe-box of toys. I love how the label reads, "Dogs Need To Play". I agree! It Took. JUST. 17.7 Seconds. 'Twas that fateful day that Frodo ditched us for grandpa. After a fun run at the field testing the NERF Ball Blaster (saving the best for last) and KONG Zinger Toy, there we - Uncle Nic, Mummy and myself, back at home. 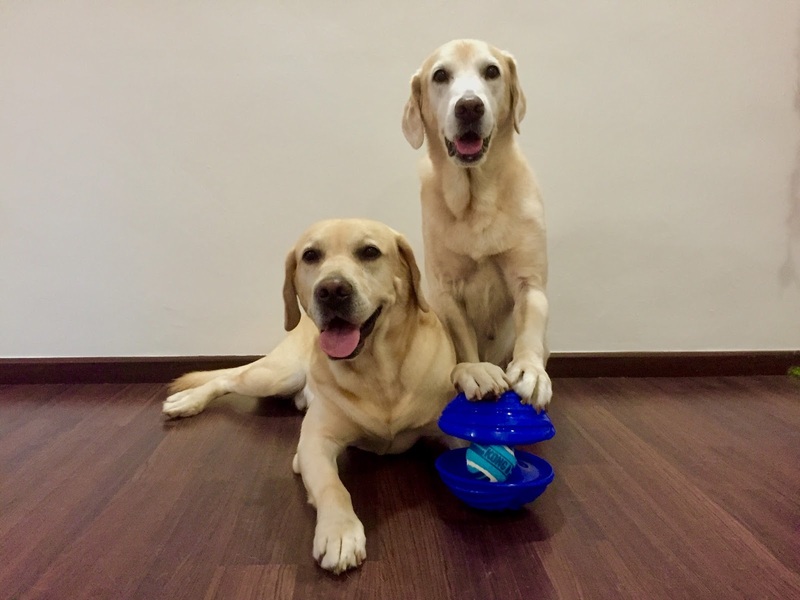 Mummy excitedly took out my brand new KONG Rambler and asked Uncle Nic, "Since Frodo Goondu Pinky is not home, let's try this toy on Flapper! I wanna see how long it takes for him to figure it out." Sony Action Cam - check. KONG Rambler Squeaks - check. Flapper Choo aka The Brain - check. Where's my thunderous applause and cheers for getting the tennis ball out? Instead they tested me again to see if my first attempt was a fluke. Still no applause nor cheers. I am certain if this was Pinky at work, they would screaming in excitement, yum seng with their gin and tonic and throwing confetti. Three tries later and 'twas the case of "Maybe this ball is smaller....."
Unce Nic, the pseudo rocket-scientist, took the toy and attempted to studiously study it. "Maybe this [tennis] ball is smaller or maybe there's one side of the toy that has a bigger opening...."
So mummy brought out our regular tennis ball to measure against. It does feel like the KONG ball is a tad bit smaller and of more compact pile. A slight difference in measurement but does it affect the 'performance'? So looks like Uncle Nic was right. 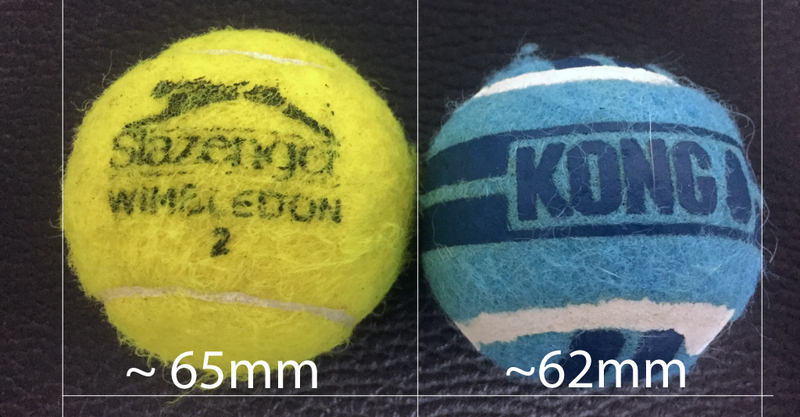 There is a slight size difference in the ball size which does affect how the ball rambles as illustrated above. Which also means, it would be a tad bit more challenging for Pinky to get the ball. The tennis ball, being that tad bit bigger, fits snugly. On the one hand, it is easier for a dog like Pinky to get it but at the same time, it requires a little more effort to detach the tennis ball. The Brain conquers the toy again. "Let's see what he does if we put TWO balls in...."
In case you have not figured, I have yet to receive any thunderous applause at this point despite my success. In fact, mummy was getting progressively annoyed as she could not believe she wasted my toy budget on this toy. Mummy called it "anti-climax". She was excited about trying this toy with me except she did not expect that I would get so quickly. She felt quite 'cheated' (by me) as she expected more mileage out of the toy. Feeling undefeated, Uncle Nic proposed, "Let's make it tougher. Let's see what he does if we put two balls in." Mummy agreed just because... she would do anything at this point just to feel that the $32.00 was well-spent. The awesome part about owning this Sony Action Cam is that mummy can easily take good quality and stable videos whenever we, Frodo and I, are testing new toys. But here's the downside (for me), it also allows mummy to study the footages on how I, the 'Brain', figure things out. In this 'part 3' of my test, was mummy's 'O.M.G.' moment when she reviewed through the footages in slow-mo and she immediately shouted out to Uncle Nic, "I know how he gets the ball." Uncle Nic watched the footage with mummy. Did you see it? He actually waits for the moment the ball is turned up then he goes for the grab! Okay Action Cam, that is so not cool. You are leaking out the secrets of my brains. Not cool at all. Anywoof, mummy was seriously pissed off after my 16.6 seconds clearance of getting two balls out, she declared most grudgingly, "Waste of money." She wondered, "Is this toy meant to exercise the dog's brains or the humans' brains? 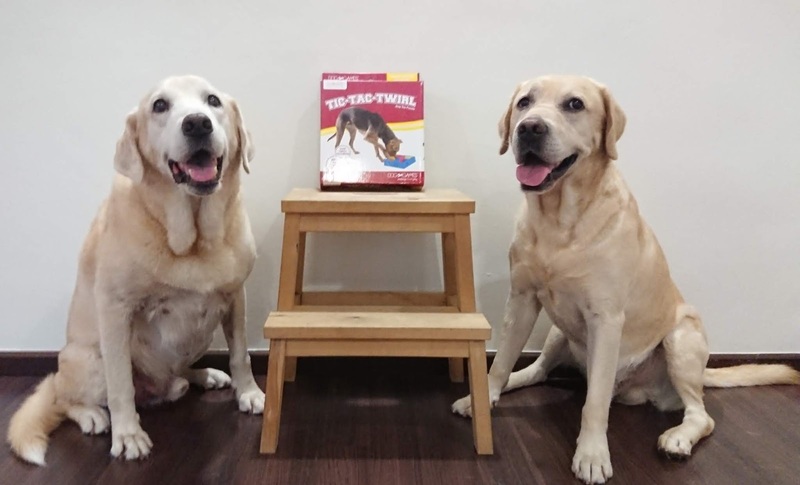 The fact that we are standing here studying the toy and thinking of ways to outsmart Flapper.... "
In her one last ditch attempt of consoling herself for squandering the budget on the KONG Rambler, she said, "Let's await the return of my 'prodigal son'. I am sure he will make this toy very worthwhile." And nope! Still no rousing cheers and applause. Sigh. By the time Pinky barged through the door after his day out with grandpa, mummy was seething in injustice over the purchase that she was determined to find some worth in the toy. Mummy quickly whipped out the Rambler and put Pinky to the test. As mummy predicted, Pinky ended up on a rambling trip to and from Timbuktu and even got lost in transition more often than he should. Remember how mummy started out seething over how easy the toy was for me? It did not take very long before she forgot and after Pinky's several failed attempts at getting the toys out, mummy called me just to have me test the toy again. "Got so difficult, meh? ", mummy was puzzled and got me to verify. And I demonstrated to Pinky HOW to get the ball. Easy! Uncle Nic even gave hints to Pinky. Okay mum. You asked for it. You wanted to find value in the toy through Pinky, your wish came true. Pinky NEVER got it on that day. You know, Flapper makes the toy look so easy that it's actually boring. Frodo, on the other hand.... can sell the toy. He makes it look fun." Do you agree with what mummy said? Post our first KONG Rambler test, surely mummy had to continue testing on Pinky to see if he will ever get the toy. There are good days with Pinky when he wakes up with an epiphany on how the toy works and he manages to get the ball out repeatedly. That's when he gives false hopes to mummy and she would think that maybe finally Pinky has developed a brain! Then Pinky will have bad days when he cannot figure the toy out and decides it is more fun just fetching and/or chewing the entire toy. Mummy bangs head against wall. What can I, the 'Brain' say? Never ever a dull moment with Pinky aka Frodo Choo aka Doh-AH! 1-Flap for me, 1-Flap for the humans. I did make them think, didn't I? Even though it's game-over very quickly for me but I love squeaky toys and don't ask me why, I can keep going for THAT tennis ball over and over again! Love it! I can senselessly ramble to Timbuktu with the toy, I can chew on the rubber big ball... I don't need to know how to remove the tennis ball but I can fetch the entire toy... The toy makes loads of noise.... what's not fun about this toy? The KONG Rambler lives up to KONG's reputation of producing quality/hardy toys for dogs. The rubber is SOLID.... not easy to break. Can't fault them for the quality. I can chew on the rubber, I can chew on the ball... can la! Eh... what does value for money mean? Bro! You work, get us more toys and I play. Will We Buy Another One? Straight out no but I have a feeling it will be a resounding 'yes' from Pinky. I want the orange one too! Maybe a small pink one for Ah-Lian? Bro! Go earn more toys! One More Toy Review To Go! Yes, my friends! I only have one more toy review to go before ending this first season of toy reviews for Kohepets! I am so excited on my last review - the NERF Ball Blaster. I have been saving my best toy buy of the season for last. It will probably take a while to finish that review as we have so many videos to show and more stories to tell! I am trying me best to finish the final toy review really soon before the Flapper10 promo ends on 15th May 2017. 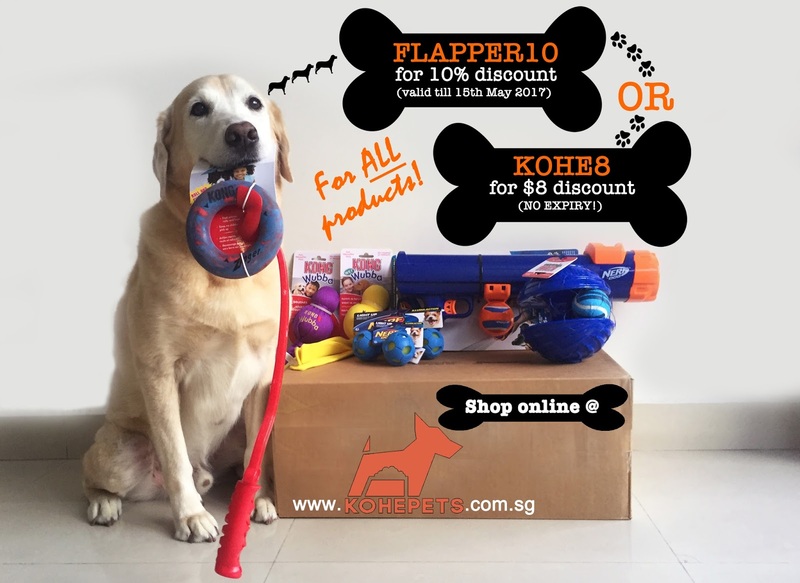 I hope my hard work in putting together all these toys reviews help our other furry-friends to make use of this once-off promo with Kohepets to purchase new toys... and other necessities or wants. Flapper10 promo is still on! As usual, if you have any questions about the toys we have reviewed, feel free to drop a comment below each respective post. Time to get to work on my exciting final review.... THE NERF BALL BLASTER!